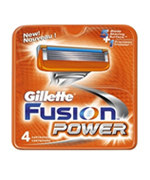 Buy Gillette Fusion Power 4 Cartridges. Five-blade shaving surface technology five blades spaced closer. These Gillette Cartridges feature a five-blade shaving surface and one precision trimmer. The Fusion Cartridges' five blades are spaced close together to help reduce pressure, so you get less irritation and more comfort. Suitable for shaving tricky places like sideburns, under the nose and around facial hair, these Power Cartridges, 4 count pack, have a precision trimmer blade built into the back of the cartridge. The Gillette Fusion Power is a precision shaving system featuring an advanced design engineered to bring you optimal performance. On the front of the cartridge, Gillette Fusion Power features 5 PowerGlide blades spaced closer together for a comfortable shave. This design distributes the shaving force across the blades to help reduce pressure, supplying more comfort and less irritation than MACH3. The comfort of five. The precision of one. Five-blade shaving surface technology has five blades spaced closer together to help reduce pressure with less irritation and more comfort. One precision trimmer blade built into the back of the cartridge. Perfect for tricky places like sideburns, under the nose, and around facial hair.